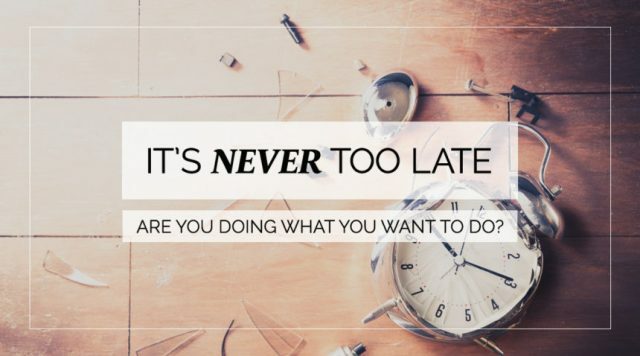 It’s Never Too Late!! – Motivational Mantras!! Did you ever have a dream on which you gave up? Is there something you wanted to achieve so badly in life but then stopped for no reason? Let me tell you, it is now the time to go for it! There are certain dreams in all of our lives, that we wanted to accomplish some or the other day but couldn’t make them due to our circumstances, fears and lack of focused vision. Remember the famous quote by Bruce Lee: To hell with circumstances, I create opportunities. This is exactly what one should do in his/her life. When you want to achieve something in life through the core of your heart, when you dream of something that actually doesn’t let you sleep, then what is the point waiting for the things to happen and circumstances to change? Why can’t we go and seek out for the opportunities that will take us a step forward to our dreams and if we don’t find them, why can’t we create them? As I always write in most of my posts that life is a series of ups and downs and you have to accept the situation and move on. Then why not accept the circumstances you are facing, deal with them and move out of them to create new. When you’ll seek and create opportunities in your life, your circumstances will automatically change. Most of you might be visiting KFC regularly with your friends and family to party or just eat up after hangout? But how many of you know about the man behind it? Do you know that the KFC founder Colonel Sanders didn’t launch KFC until he was 62 years old? He was an entrepreneur who sold fried chicken at his roadside restaurant in Corbin, Kentucky during the Great Depression. Later on he took his chicken concept to US market and when finally KFC got its name, it’s tremendous growth shocked everyone. In 1960 the company had around 200 franchised restaurants; by 1963 this had grown to over 600, making it the largest fast food operation in the United States. By the end of the year 2014, there were 18,875 KFC outlets in 118 countries and territories located across the world. I hope this example has explained much to all of you. One should have the zeal within to do something in life and you can achieve it anytime by virtue of your hardwork and dedication. There is always a way out but your potential lies in finding that way and once again go for the dreams you have given up on for that can make a big difference in your life! You yourself have to find the path to your dreams and while doing that, you just can’t afford to give up! Previous Don’t be Afraid of Failures!! Next You Have to Be Strong! !